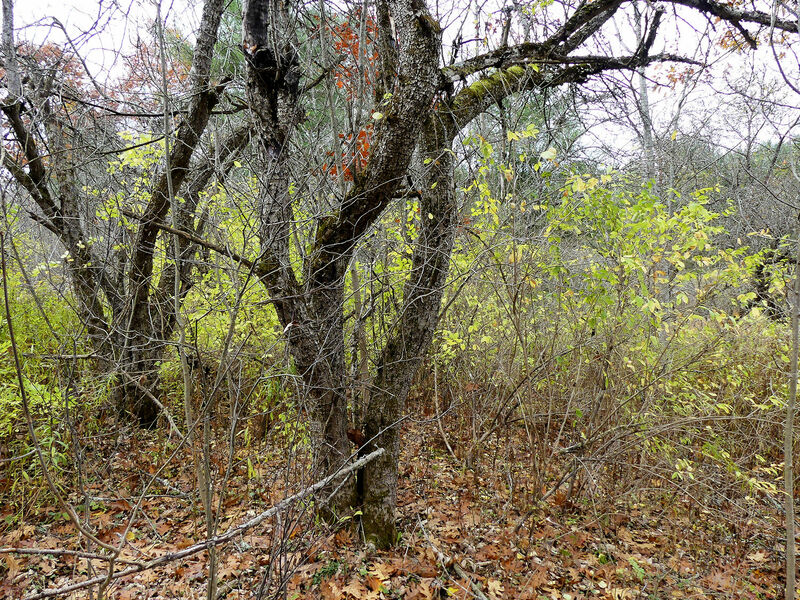 After the main leaf drop–which is helped along by wind and rain–I like to walk around our acreage to see what in the understory still has leaves. Those shrubs are typically aliens, because it takes longer for them to get the memo that winter is coming. I spy a burning red bush that hasn’t dropped its leaves. 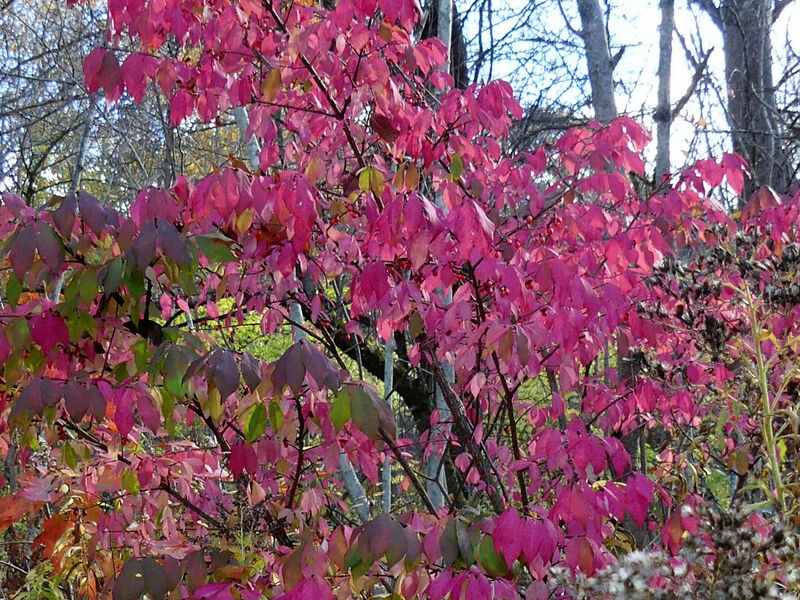 When we moved here five years ago, there was a burning bush (Euonymus alatus) planted by the mailbox and two more planted by the front door. I removed them because they are invasive in New England and I didn’t want to take the chance of them spreading to the woods here. (They have since been banned in NY.) After all, my climate in upstate NY is not that different. This particular shrub was growing where the lawn meets the woods. It wasn’t planted by human hands and its blazing red color stood out from the other vegetation. I can’t tell you how long it’s been there because I never noticed it before–burning bush isn’t very distinctive until autumn–but I’m glad I removed the other burning bushes from my landscape before even more seeds germinated. Over on the other side of the house, some bronzy red foliage caught my eye. 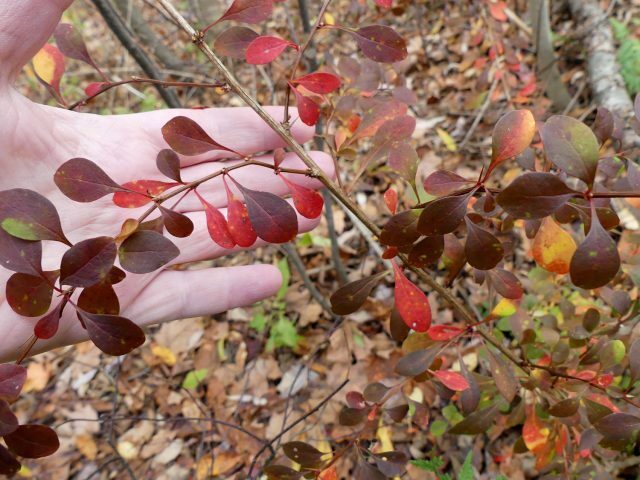 Yes, this is barberry. Probably Japanese barberry, as that’s what used to grow on the west side of the house before it, too, was removed. And did you notice the pale green leaves behind the barberry in the first picture of it? That’s Tartarian honeysuckle, which I’ve been battling for a long time. Tartarian honeysuckle is why I pay attention when someone says a shrub is invasive. We may have an odd burning bush and a handful of barberry shrublets, but Tartarian honeysuckle carpets the understory, shading out the spring ephemerals that I love. All that golden-leaved foliage in the background is Tartarian honeysuckle. And like barberry and burning bush, Tartarian honeysuckle was originally brought into this country as an ornamental landscape plant. Everyone thought it was harmless for years. Beautiful pictures! I’ve always wondered how plants gradually make their way across the world so far from their native origins. Great post but only the beginning. 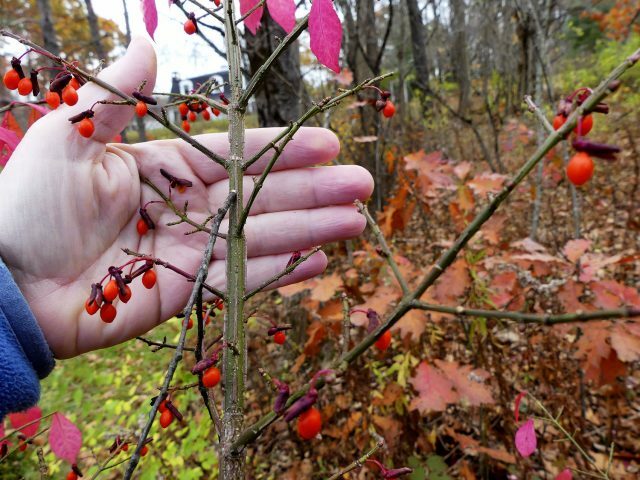 North American Native Plants Society and many others are doing a great job of teaching about exotics and the harm they do, especially in the few remaining woods. And they are working like you to keep a few woods free of the main “invaders”. Here in Ontario we are concerned about Buckthorn, also a European introduction, that proliferates and takes over in understory shade. Garlic mustard is a persistent and difficult weed of the same shady habitat. Both, like the examples you talked about, keep their leaves longer than any natives. This makes them more vigorous I imagine as they continue to gather sunlight longer and store sugars. Keep up the good observations. BTW the west coast has perhaps more problems as the evergreen invaders keep going all year and beat out natives there. I am well familiar with garlic mustard as you can read here: Mother’s Day Mustard Pull. Also visit my Native and Invasive category for many other posts on this topic. Excellent pointers. Maintenance is the hardest part of landscape restoration. Those darn birds/critters keep popping seeds into my yard! And the latest scourge-Emerald Ash Borer wiping out our native ashes.There is a larger,more destructive stink bug in Missouri,headed north.Life is change. Well…except for the non-native pests that are wiping out Iowa’s native lindens,oaks,etc.Hackberries are the only tree my Extension guy said is safe(for now) if you insist on natives.Insects and disease do not recognize borders. I agree, Kathy, insects and disease don’t recognize borders. They are just trying to survive. I realize the whole question of native and invasive, or perhaps better to say indigenous and exotic, is quite a bit more complicated than I’ve presented in my post. I’ve often wondered why suddenly after eons of survival of the fittest, we now feel we should interfere with the evolutionary process, and decide who stays and who goes. I have decided that even though the woods on my property appear “wild,” I am actually gardening there as well. I want spring ephemerals to flourish, so I am taking out the plants that keep them from thriving. They just happen to be alien shrubs. That is the only way I can think about it and not feel like a hypocrite. This is great! I am going to walk around the woods at our lake property and look for suspicious foliage – thank you. The Staghorn Sumac around and on the drive to the lake is absolutely stunning this year! I hope to harbor a patch of it near us. 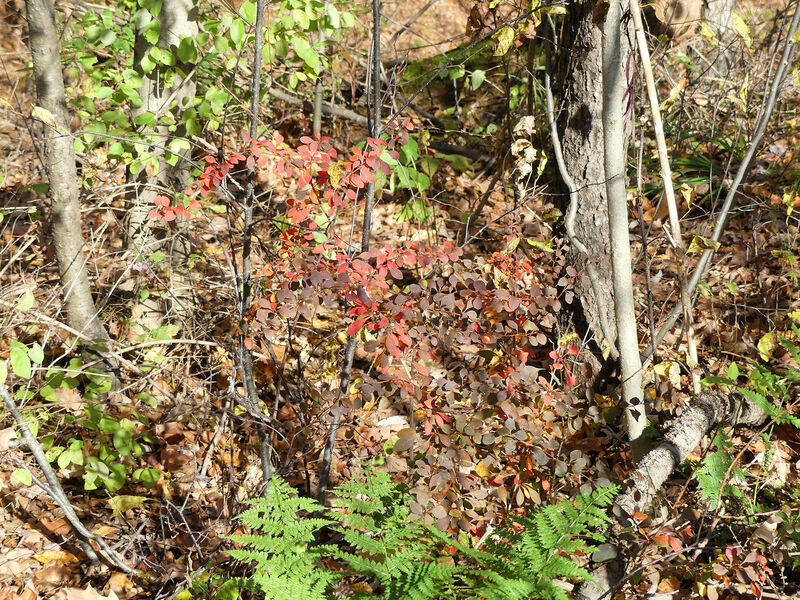 In the village I remember pulling out a huge barberry planted out front a few years back only to gaze across the street at two more and a burning bush (sigh). I had volunteer barberry for a couple of years but I think it’s safe to say it has now been eradicated. I have to GTS about Tartarian honeysuckle – that looks bad! You just reminded me to do my yearly inspection of my property. I have been battling the non-native honeysuckles since I moved in. I haven’t won the war but I’m making progress. 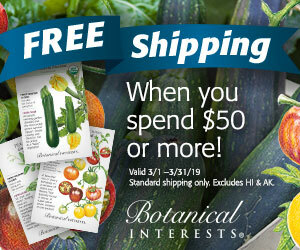 I haven’t seen any barberry seedlings yet, but I’ll keep a lookout. My other pet peeve are those stupid ornamental pears. They too will hold the leaves which makes them easy for me to find and clear out in the fall – an they have huge thorns. I wish that process worked in my climate, but here, a lot of things stay leaved all year round, even natives. 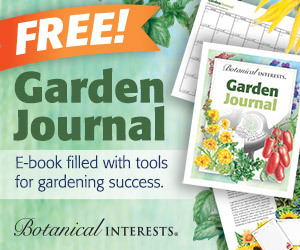 (I live near Seattle) And why am I reading a cold-climate gardening blog? Because it’s interesting! Well, thanks. Glad you find it interesting. 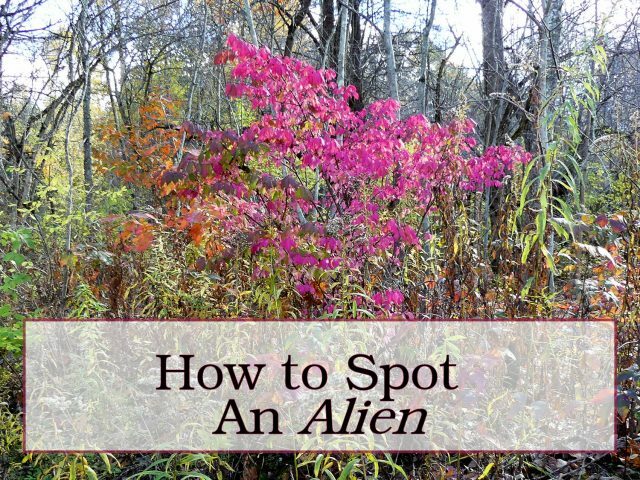 I never thought of looking for harmful aliens by checking out persistent leaves. This is a very good idea and one that I will both follow myself and share. Thanks, Kathy. You’re welcome, Pat. Of course it wasn’t original with me. I read it in one or more books before I tried it myself. It’s amazing to drive around here in early winter and see the green understory of different woodlots, filled with invasive Japanese honeysuckle. It’s awful here. 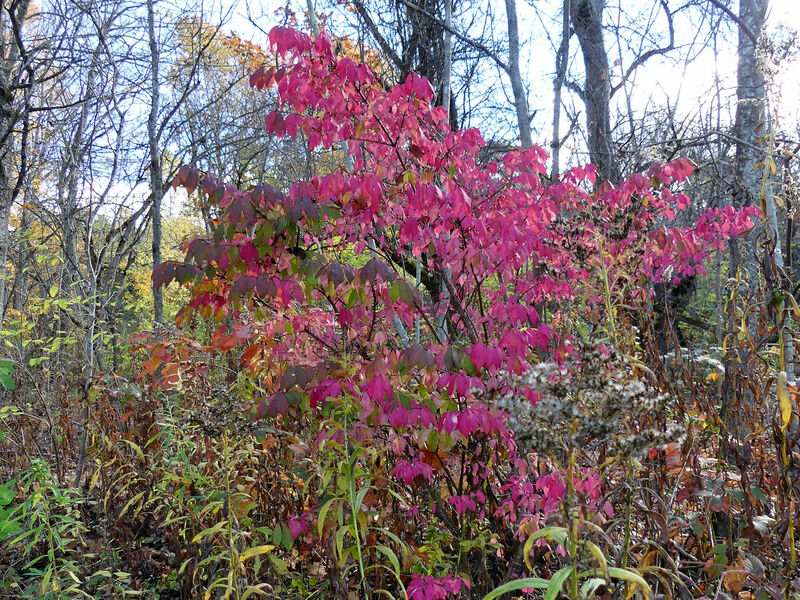 Did you cut out the burning bush and barberry after you took the pictures? I haven’t taken either out yet. The weather turned rainy and then rather cold, so I am waiting until the next warmish day to take care of them. Kathy, Great post! Informative and helpful.